Sulfur-deprived cultivation of Chlamydomonas reinhardtii, referred as “two-stage culture” transferring the cells from regular algal medium to sulfur-deplete one, has been extensively studied to improve photobio-H2 production in this green microalga. During sulfur-deprivation treatment, the synthesis of a key component of photosystem II complex, D1 protein, was inhibited and improved photobio-H2 production could be established in C. reinhardtii. However, separation of algal cells from a regular liquid culture medium to a sulfur-deprived one is not only a discontinuous process, but also a cost- and time-consuming operation. More applicable and economic alternatives for sustained H2 production by C. reinhardtii are still highly required. In the present study, a significant improvement in photobio-H2 production was observed in the transgenic green microalga C. reinhardtii, which employed a newly designed strategy based on a heat-inducible artificial miRNA (amiRNA) expression system targeting D1-encoded gene, psbA. A transgenic algal strain referred as “amiRNA-D1” has been successfully obtained by transforming the expression vector containing a heat-inducible promoter. After heat shock conducted in the same algal cultures, the expression of amiRNA-D1 was detected increased 15-fold accompanied with a 73% decrease of target gene psbA. More interestingly, this transgenic alga accumulated about 60% more H2 content than the wild-type strain CC-849 at the end of 7-day cultivation. The photobio-H2 production in the engineered transgenic alga was significantly improved. Without imposing any nutrient-deprived stress, this novel strategy provided a convenient and efficient way for regulation of photobio-H2 production in green microalga by simply “turn on” the expression of a designed amiRNA. Due to the irreversible consumption of global energy reserves and the serious environmental pollution problems, hydrogen (H2), one of the most effective and clean fuels, is attracting tremendous attention currently [1–3]. In contrast to industrial H2 production mainly by steam reforming from fossil fuels, photobio-H2 production by green algae is of great interest because (i) it utilizes simply solar energy and water for H2 generation ; (ii) algal cells are easily cultivated by relatively cheap inorganic elements ; and (iii) the algal hydrogenase enzymatic conversion of H2 is reported possessing the highest catalytic efficiency among all known H2-producing organisms [6–9]. As the model organism of green algae, Chlamydomonas reinhardtii has been extensively used to study the phtotobio-H2 production in recent years . In addition, a sulfur-deprived cultivation method discovered by Melis et al. solved the key barrier of phtotobio-H2 production by photosynthetic C. reinhardtii . When the protein D1, one member of the photosystem II (PS II) complex, was inhibited during sulfur-deprived cultivation, it resulted in a reduced activity of PS II and thus a suppression of photosynthetic O2 evolution. It was also reported that a copper responsive inducible chloroplast expression system targeting Nac2 protein, which is required for the stable accumulation of the psbD mRNA encoding the D2 reaction center polypeptide of PS II, can be used to turn off PS II activity and thereby impose a potential for hydrogen production in C. reinhardtii . However, the implementation of sulfur-deprivation technique needs laborious downstream process, such as cost- and time-consuming of separation of algal cells from a regular liquid culture medium to a sulfur-deprived one. Moreover, obviously this method was not a continuous process. More applicable and economic ways for the practice are still highly required . microRNAs (miRNAs) are usually small RNAs 21–22 nucleotides long, but with important regulatory roles found in eukaryotes including C. reinhardtii [14–17]. Recently, we have identified 22 new miRNAs and their targets which were responsive to sulfur-deprivation treatment in C. reinhardtii . In 2008, Zhao et al. and Molnar et al. developed a novel strategy using artificial miRNA (amiRNA) to regulate the function of given genes in C. reinhardtii. Since then, more amiRNA studies in C. reinhardtii have been conducted [21, 22], showing the promising utility of amiRNA technique on gene functional regulation in this species. In this study, since the turnover of D1 protein in PS II complex of C. reinhardtii has been confirmed to be correlated with the improved H2 yield by the sulfur-deprivation method, we proposed here a new strategy on regulation of photobio-H2 production by C. reinhardtii. With a heat-inducible amiRNA expression system targeting D1-encoded gene, psbA (GenBank: MF083692), a “turn on” effect corresponding to improve H2 production could be expected upon the induction of this amiRNA-D1 expression inside the same algal culture. In the present study, we constructed an amiRNA-targeting psbA in C. reinhardtii. When the transgenic algae were heat-treated, difference in H2 production capacity was observed between the transgenic and control cells, resulting in about 60% more H2 accumulated at the end of the gas collection period (7 days). Without changing the culture medium, these results might suggest a convenient way for continuous H2 production by green microalgae. With the help of two enzymatic digestion sites NheI and PmaCI, the precursor of amiRNA-D1 was inserted into the expression vector pH124 under the control of a heat-inducible promoter HSP70A-RBCS2 (Fig. 1). The amiRNA-D1 sequence was designed by a web-based tool WMD3. Following selection criteria have been used to select the candidate miRNA: (i) no mismatch between positions 2 and 12 of the amiRNA for all targets; (ii) one (or two) mismatches at the amiRNA 3′ end (position 18–21); (iii) similar mismatch pattern for all intended targets; (iv) absolute hybridization energy between − 35 and − 38 kcal/mol; (v) effect of target site position on effectiveness of amiRNA (Fig. 2a, b). As a result, the sequence 5′-TATGTTGCAGTAAGAAGACAGC-3′ (amiRNA-D1-1) located at 116 and 137 nt of the target gene and the sequence 5′-TTTGGAAGATTAGACGACCAGC-3′ (amiRNA-D1-2) located at 763–784 nt of psbA CDS were considered as the best candidates out of 10 proposed sequences (Fig. 2b). H2 production detected by gas chromatography (GC) indicated that amiRNA-D1-2 should be more efficient in silencing target gene psbA (Fig. 2c). Accordingly, amiRNA-D1-2 (hereafter short for amiRNA-D1) was used in the following experiments. Loop–stem structure of miRNA1162 precursor and amiRNA-D1 sequences are shown in Fig. 2d. About 2 weeks after algal transformation, single colonies could be observed on TAP agar plates containing antibiotics zeocin. Genomic DNA was isolated from positive transformant and PCR was performed to verify the correct integration of amiRNA-D1 on the nuclear genome of C. reinhardtii. We observed clearly that one fragment with expected size of 593 bp was successfully amplified, while no single PCR band could be visualized with DNA from WT (Fig. 3a). In addition, small RNAs were extracted from transgenic algae and one RT-PCR product with a size of 110 bp could be observed from Fig. 3b. The positive bands were purified and sequencing verified. These results revealed that the algal transformation was successfully performed and the amiRNA-D1 was actively transcribed. The changes in growth rate and chlorophyll content of transgenic algae after algal transformation were also investigated. It was observed that the transgenic operation had no significant impact on the growth rate or chlorophyll content (Fig. 4). With a slightly slow growth rate compared to WT algae, the cell density and chlorophyll content of the transgenic alga attainted about 4–5 × 106 cells/mL and 20 mg/L, respectively, at 5th day. To verify the effect of heat shock treatment on expression of amiRNA-D1 and its target psbA gene, we used the qRT-PCR technique to detect their transcript abundance in both transgenic and WT algae. Incubation at 42 °C for 1 h has been proved to be the most efficient condition for promoting foreign gene expression driven by HSP70A-RBCS2 heat-inducible promoter . As shown in Fig. 5, the quantity of amiRNA-D1 transcript in transgenic algae was about 15-fold more than that in control after incubation in 42 °C for 1 h, suggesting that the inducible promoter HSP70A-RBCS2 effectively promoted the expression of amiRNA-D1. Moreover, after the same heat shock treatment, the expression of psbA gene in transformant was about 73% lower than that in control. These results therefore confirmed the down-regulation function of constructed amiRNA-D1 against its target psbA gene. To test the effect of heat-induced amiRNA-D1 expression on photobio-H2 production, gas chromatography was used to determine the content of gas in the headspace of WT and transgenic algal cultures. The difference in total H2 yield between transgenic and WT algae could be observed since 2nd day after heat induction (Table 1). The transgenic algal culture produced 48.6% (± 6.5%) more H2 than the WT group at 4th day and this increase in total H2 yield was detected until the end of the experiment. As a consequence, the transgenic algal culture reached its maximum level at 7th day, with 57.1% (± 28.6%) more H2 accumulated than the WT group. This promotion of total H2 output was also in accordance with the H2 production per microgram chlorophyll content (Fig. 6a). Meanwhile, the O2 contents in gas phase showed a more rapid O2 consumption in transgenic alga than the WT strain (Fig. 6b), dropping to about 4% in the mutants after 7 days while the number was more than 10% in the WT. Sulfur-deprived cultivation of C. reinhardtii  was previously regarded as the most efficient technique to enhance photobio-H2 production in microalgae [24–26]. Under the sulfur-depletion condition, the amount of D1 protein was significantly reduced . And thus a reduced photosystem activity was observed, resulting in a significantly prolonged H2 production in C. reinhardtii [11, 26]. In the present study, we showed for the first time a novel strategy on regulation of D1 through artificial miRNA to improve the photobio-H2 production in C. reinhardtii. Instead of making irreversible changes on D1 protein like amino acid substitutions, we chose amiRNA, a newly developed technique, to conditionally control the expression of this target gene. MiRNAs are a family of regulatory small RNAs with down-regulated function on their target genes at either transcriptional or translational level . Based on the discovery of sulfur-deprivation on C. reinhardtii that the inhibition of D1 synthesis was correlated with the improved photobio-H2 output, we proposed here to achieve the similar inhibition on D1-encoded gene using amiRNA technique. Several advantages made us to express amiRNA-targeting psbA to regulate C. reinhardtii H2 production: (i) it has been showed that amiRNA technique in C. reinhardtii was successful [19–22, 28, 29]; (ii) alternatives are highly demanded for sustainable H2 production in C. reinhardtii; (iii) induction of foreign gene expression in C. reinhardtii was widely employed and it can be accomplished in the same culture medium [19, 20, 30–33]. The constructed vector with a heat-inducible promoter was then transformed into C. reinhardtii and expected properties of transformant cells were showed with a down-regulated expression of the target gene psbA against a corresponding up-regulated expression of amiRNA-D1. These results suggested that a successfully constructed amiRNA-D1 was functional at the post-transcriptional level in transgenic C. reinhardtii. Several other studies have showed their success towards improving H2 production by mutating D1 protein in C. reinhardtii [34, 35]. Recently, Torzillo et al. showed that a C. reinhardtii D1 mutant strain carrying two amino acid substitutions resulted in better performance on total H2 output and H2 production duration under the sulfur-deprived condition . Nevertheless, once the mutation on D1 was conducted in C. reinhardtii, it is an irreversible operation which means the PS II complex of these algal cells would be affected permanently. Long-term effects of the capacity of H2 production in the mutants such as starch accumulation could be expected, and the work of Posewitz et al. already showed that a decreased capacity in storing starch might compromise the H2-released duration . Thus, it is obviously inappropriate for sustained algal photo-H2 production using D1 mutant strains. Compared with these mutants, our amiRNA-D1 obviously showed advantages since it is an inducible system. More interestingly, the correlation between the heat induction of amiRNA-D1 expression and the improved H2 production capacity has been confirmed in our transgenic algae. After a period of 7-day culture after heat induction treatment, the transgenic algae produced in total about 60% more H2 than the WT at the end of the test (Table 1). This increase in total H2 output was also in accordance with the H2 production per microgram chlorophyll content, which was about 50% more H2 produced by transgenic alga at 7th day after heat induction (Fig. 6). Even though the detailed characterizations on this transgenic alga were still ongoing, the improved H2 production capacity after expressing amiRNA-D1 might be partially explained by a more rapid consumption of O2 during the test (Fig. 6). A similar effect on improvement of H2 production in green alga has been observed in several previously reported studies [38, 39], which used the co-cultivation of a fermentative bacterium to reduce the O2 content and enhance the H2 production in these cells. This improvement in H2 productivity of our transgenic algae was comparable with reported methods under sulfur-replete conditions [40, 41]; however, some factors might still account for the less significant yield of photobio-H2 production by this transgenic alga when compared with sulfur-deprived cells [11, 24–26] or D1 mutants : (i) although a very effective knock-down effect of amiRNA-D1 on its target gene (Fig. 3), the mRNA level of psbA gene could not be totally silenced due to the limitation of artificial miRNA technique; (ii) pretreatment of the cultures such as sparge with argon was not conducted before the detection of the gas content, which resulted in a relatively higher O2 content (~ 18%) in the headspace of the cultures; (iii) the heat induction which consisted of an incubation at 42 °C for 1 h is the most common and efficient way for promoting foreign gene expression in C. reinhardtii [30–33]; however, this treatment before the gas detection might have negative impacts on photobio-H2 production performance; (iv) the mechanisms of action of non-coding RNA in C. reinhardtii still need further clarification based on the limited reports [18, 42]. Even though our study provided a potential for hydrogen production using amiRNA targeting a PSII protein, the amounts of H2 production under current experimental conditions were still relatively low. The optimization of treatment conditions and gas detections are underway in our laboratory. In a summary, our study added evidence to the possibility of employing designed amiRNA to enhance the photobio-H2 production in green microalgae, without the trouble of changing the culture medium. A cell-wall-deficient C. reinhardtii strain, CC-849, was obtained from the Chlamydomonas Genetic Center of Duke University (Duke University, Durham, NC, USA) and served as the wild-type (WT) strain. Cells were cultured in TAP (Tris–acetate–phosphate) medium at 25 °C and under continuous cool-white fluorescent lamps (≈ 200 μmol photons/m2/s). Antibiotic was only used for positive transgenic colonies. Once the positive colonies were verified, cells were cultivated in normal medium without antibiotics. For conducting heat shock induction, 400 mL cells (WT and transgenic, cell density of ≈ 1 × 107 cells/mL) were incubated in a water bath at 42 °C for 1 h. After the treatment, algal cells were subjected for gas detection and quantitative real-time PCR analysis. Algal cells for H2 detection and physiological analysis were sampled from different bottles, since the bottles for H2 detection were sealed until the end of the experiment. Cells of the WT and transgenic algae (400 mL) at mid-logarithmic phase were transferred into glass bottles with a total volume of 500 mL, and then sealed with the gas-tight septum. The cultures were incubated in dark for 24 h before detecting the gas content in the headspaces, and then the cells were cultivated under continuous light. Three bottles of transgenic strain and three bottles of CC-849 were set for H2 detection after heat induction. All these six bottles were sampled at each time point, and then was placed back to normal growth condition under continuous white light at 25 °C. A gas chromatograph with a thermal conductivity detector was used to determine the concentration of H2 and O2 (Agilent 7890A; Agilent Technologies Inc., USA). 1 mL of gas in the headspace of the cultures was sampled with a gas-tight syringe. Gas samples were next separated by a molecular sieve column (type 5 Å; 2 m × 1/8 mm), and argon was used as the carrier gas. Cells in the liquid TAP media (cell density of ≈ 1 × 107 cells/mL) were inoculated into the new culture flasks with triplicates. The growth and chlorophyll content of these new cultures were recorded each day during a 7-day monitoring. The algal cell growth was monitored by spectrophotometer (UV-1800, MAPADA Instruments, Shanghai, China) at 750 nm. For the chlorophyll measurement of algal cells, Spreitzer’s method  was applied after a step of 95% ethanol extraction. The expression vector pH124 containing the ampicillin- and zeocin-resistant genes and a strong heat-inducible promoter (HSP70A-RBCS2) was constructed and maintained in the College of Life Sciences, Shenzhen University. Pre-amiRNA-D1 was constructed into the pH124 based on the backbone of the precursor of miRNA1162 as previously described , mainly for its highly expressed property in C. reinhardtii. The vector pH124 system will randomly integrate the promoters, amiRNA and the antibiotics marker together into the nuclear genome . Enzymatic digestion sites of NheI (GCTAGC) and PmaCI (CACGTG) were added at 5′- and 3′-end of pre-amiRNA-D1, respectively, and the mature part of the precursor of miRNA1162 was replaced by that of amiRNA-D1 (Fig. 1). To select the most appropriate sequence targeting to psbA gene, a web-based tool for amiRNA design was used to develop our mature amiRNA-D1 (WMD3, http://wmd3.weigelworld.org/cgi-bin/webapp.cgi). amiRNA-D1 (5′-TATGTTGCAGTAAGAAGACAG-3′) is complementary to nucleotides 117–137 bp of the coding region of psbA, while the amiRNA-D1* sequence (5′-CTGTCTTCTTACTGCAACATA-3′) is used to maintain the structure of the amiRNA duplex. The constructed pre-amiRNA-D1 (155 bp) was commercially synthesized in vitro and was cloned in plasmid pUC57 (Sangon Biotech Co., Ltd, Shanghai, China). The final construction of pH124-amiRNA-D1 was completed by inserting pre-amiRNA-D1 into an empty pH124 vector with the help of two previously designed recognition sites NheI and PmaCI (Fig. 2). Algal transformation with pH124-amiRNA-D1 was conducted using the glass-bead method as previously described . Genomic DNA was extracted from both WT and transgenic algae using the DNeasy kit (Takara, Japan). PCR was performed according to the standard protocols  to verify the presence of amiRNA-D1 on transgenic alga. 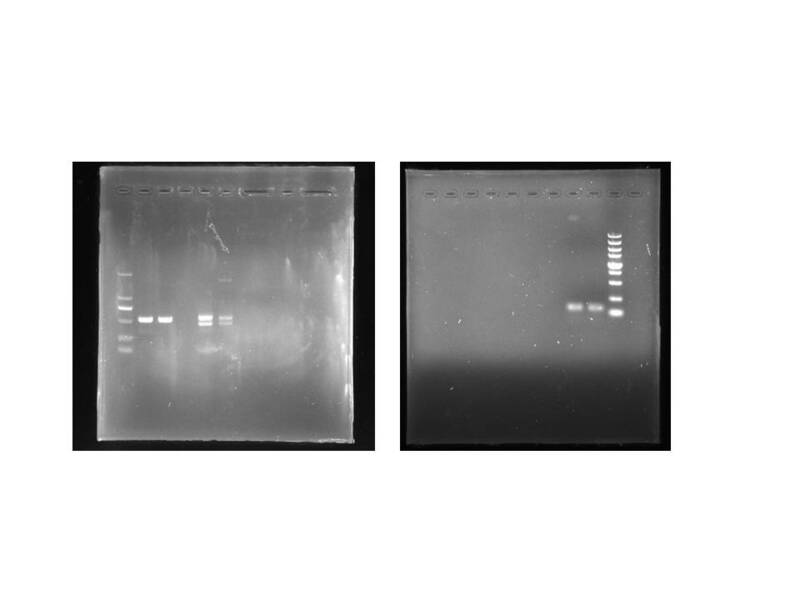 PCR was performed using the primer pair D1g-F (5′-TGACCTCCACTTTCAGCGACA-3′) and D1g-R (5′-ACTTGAGAGCAGTATCTTCCATCCA-3′), which resulted in an amplicon of about 600 bp. PCR conditions were incubated at 94 °C for 5 min, followed by 25 cycles of 94 °C for 30 s, 55 °C for 30 s, and 72 °C for 30 s, plus a final extension for 7 min. All the amplified products were purified and verified by sequencing analyses (Sangon Biotech., Shanghai, China). WT and transgenic algae were harvested and were incubated at 42 °C for 1 h before extraction of total RNA. RT-PCR analysis was next performed to verify the expression of the target gene psbA and amiRNA. Total RNA from both WT and transgenic alga was isolated, respectively, using the TRIZOL reagent (Invitrogen, Life Technologies, Carlsbad, CA). High molecular weight RNA and low molecular weight RNA were separated as previously reported . For the first group RNA, classic reverse-transcriptase M-MLV and random primer (Takara, Japan) were used to accomplish the reverse-transcription according to the manufacturer’s protocol. For the second group mainly small RNAs, polyadenylation and transcription were performed according to S-Poly(T) method . Briefly, reverse-transcription was initialed by a step of polyadenylation at 37 °C for 60 min in a 50-μL reaction mixture with 1.5 μg of total RNA, 1 mM ATP, 2.5 mM MgCl2, and 4 U poly(A) polymerase (Takara, Japan). Phenol/chloroform extraction and ethanol precipitation were next used to recover the Poly(A)-tailed sRNA. After treated with RNase-free DnaseI (Takara, Japan), the sRNAs were reversely transcribed using poly (T) adapter (5′-GTGCAGGGTCCGAGGTCAGAGCCACCTGGGCAATTTTTTTTTTTCTGTCT-3′). The final RT-PCR was realized using a universal reverse primer (5′-CAGTGCAGGGTCCGAGGT-3′) and the specific forward primer (5′-TGTCGGTATGTTGCAGTAAGA-3′), which resulted in an amplicon of about 110 bp. The amplified positive products were verified by sequencing analyses (Sangon Biotech., Shanghai, China). To quantitatively detect the change of amiRNA-D1 and psbA expression in both WT and transgenic alga, qRT-PCR was performed with Applied Biosystems 7300 real-time PCR System (Framingham, MA, USA), and the primers used are listed in Table 2. RNA extraction from the heat-shocked WT and transgenic algae was as previously described for “RT-PCR analysis”, while the RNA extracted from the untreated WT and transgenic algae was used as the control. The standard protocol was applied to psbA expression detection using SYBR Premix Ex Taq™ II (Takara, Japan) according to the manufacturer’s instruction, while the expression of amiRNA-D1 was detected as previously described . Briefly, using SYBR Green Real-time PCR Master Mix (Toyobo, Osaka, Japan), each reaction containing 1 μL of diluted cDNA (about 100 pg of RNA, previously reverse-transcribed by S-Poly(T) method), 10 μL of 2× SYBR green reaction mix, and 5 pmol of the forward and reverse primers were added to make a final volume of 20 μL. PCR conditions were as follows: one step of 95 °C for 30 s, followed by 40 cycles of 95 °C for 5 s and 60 °C for 30 s. Analysis of the melting curve of amplicons was used to test the specificity of the primers. The actin gene and U4 snoRNA were used as a reference gene in the qRT-PCR detection of psbA and amiRNA-D1, respectively. The data with an R2 above 0.998 were analyzed using the 2−ΔΔCt program . All experiments were repeated at least three times independently, and data were recorded as the mean with standard deviation (SD). Statistical analyses were performed using the Student’s t test and Pearson correlation analysis (SPSS13.0). For all of the data analysis, a p value < 0.05 was considered statistically significant. HL participated in all experiments and drafted the manuscript. YL participated in the primer design and qRT-PCR. YW and MC carried out the experiment of gas detection. XZ carried out the vector construction. CW participated in identifying the positive transformants. JW participated in drafting the manuscript and performed the statistical analysis. ZH participated in the design of the study and guide the study. All authors read and approved the final manuscript. This work was supported by the National Natural Science Foundation of China (31470431, 31470389), Guangdong Natural Science Foundation for Major cultivation project (2014A030308017), Guangdong Natural Science Foundation (2016A030313052), Project of DEGP (2015KTSCX125), Demonstration Project for Marine Economic Development in Shenzhen (2017 documents No.283, Department of the Science and Technology, China’s State Oceanic Administration) and Shenzhen special funds for Bio-industry development (NYSW20140327010012). 13068_2018_1030_MOESM1_ESM.jpg Additional file 1: Figure S1. Full-length gels of Fig. 3.